What is the NCGC Pharmaceutical Collection (NPC)? How do I get access to the NPC? How do I download the NPC Browser? What's in the NPC browser? How reliable are the compound records in the NPC browser? How can I build my own NPC physical collection? Has the NPC screening library been characterized analytically? How do I cite the NPC resource? The NCGC Pharmaceutical Collection (NPC) is a comprehensive, publically-accessible collection of approved and investigational drugs for high-throughput screening that provides a valuable resource for both validating new models of disease and better understanding the molecular basis of disease pathology and intervention. The NPC has already generated several useful probes for studying a diverse cross section of biology, including novel targets and pathways. NCGC provides access to its set of approved drugs and bioactives through the Therapeutics for Rare and Neglected Diseases (TRND) program and as part of the compound collection for the Tox21 initiative, a collaborative effort for toxicity screening among several government agencies including the US Environmental Protection Agency (EPA), the National Toxicology Program (NTP), the US Food and Drugs Administration (FDA), and the NCGC. Of the nearly 2750 small molecular entities (MEs) that have been approved for clinical use by US (FDA), EU (EMA), Japanese (NHI), and Canadian (HC) authorities and that are amenable to HTS screening, we currently possess 2,400 as part of our screening collection. The NPC resource currently consists of (i) the physical collection suitable for high throughput screening (HTS) and (ii) the informatics browser and database. Putting together the physical collection has been surprisingly challenging in terms of the time and effort required in the informatics, compound management and synthetic chemistry related activities required for this endeavor. We provide access to the NPC screening library through collaboration. Please contact Noel Southall for additional information. The other half of the NPC resource is the NPC browser. This is a self-contained software that is actively developed and maintained by the informatics group to provide electronic access to the NPC content. The latest version of the NPC browser for various platforms can be downloaded below. Please let us know if your platform is not listed. Note that a fairly modern hardware (preferably with at least 2Gb of memory) is required to run the browser effectively. 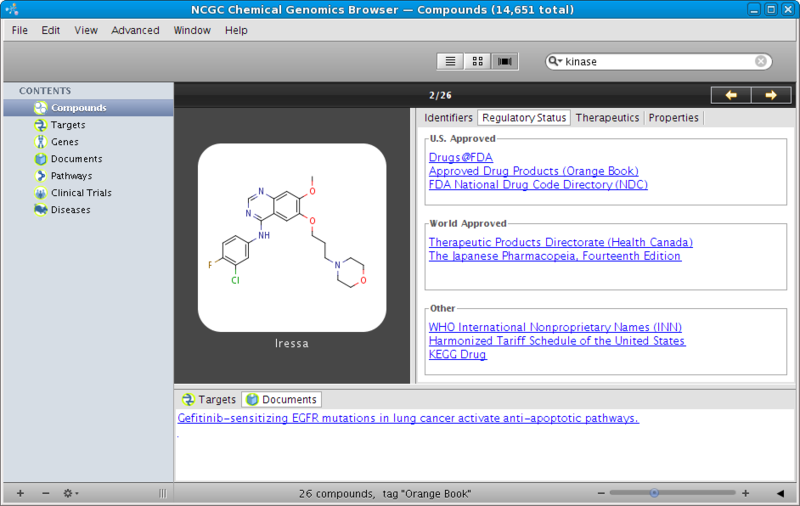 The primary focus of the NPC browser was initially on approved molecular entities. In the current version, however, we have expanded it to include clinical candidates as well as other useful tool molecules. We hope to eventually reach a steady state whereby new molecular entities registered with the USAN and INN are automatically incorporated into the browser. Although we strive to be as accurate as possible, due to the inherent nature of how chemical structures are defined and represented electronically, it is simply not possible to have an error-free database. Despite our best efforts on curation, every structure is suspect until proven otherwise. This sentiment certainly applies equally to any chemical database. The NPC resource is—and will continue to be—an ongoing effort as curation proceeds, new molecular entities are added as they are registered or approved, and errors are found. This process will benefit enormously from community feedback, and we encourage users to use the curation mechanism within the browser to fix and/or report errors. One of the most challenging efforts in putting together the NPC physical collection has been that of finding suitable and reliable chemical suppliers. Furthermore, when drugs cannot be sourced, access to synthetic chemistry is essential. Additionally, access to good compound management and analytical chemistry resources is essential in quality control and proper handling of the drugs collection. Where possible, we have included supplier names and catalog identifiers in the browser to enable anyone to build their own physical collection. Given the current collection has been sourced from a combination of traditional chemical suppliers, specialty collections, pharmacies and custom synthesis, any serious attempts at replicating the NPC physical collection will likely to require significant amount of time and resources. 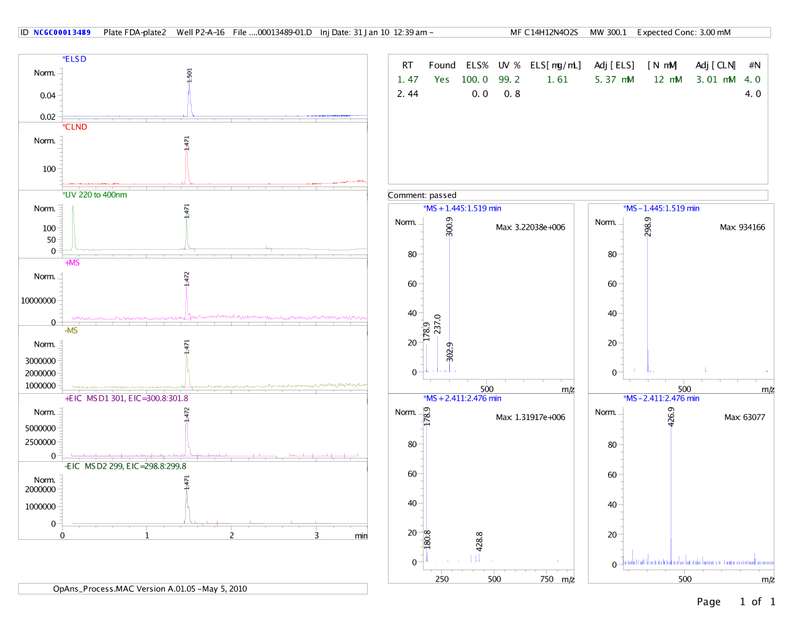 The NCGC analytical chemistry group is currently generating QC LC/MS data for all compounds in the NPC physical collection. 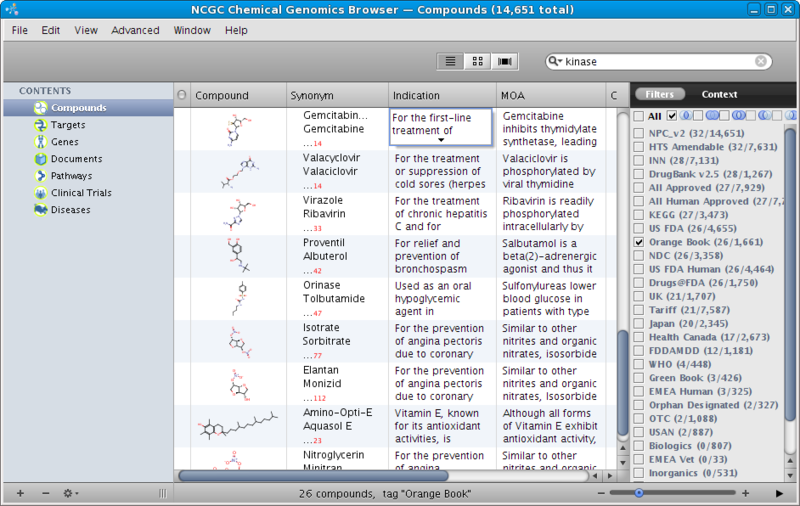 Where QC report is available, a compound record in the NPC browser is marked with the icon . If you make use of the NPC browser and/or database in your research, please use the following citation to acknowledge the NPC resource. R. Huang, N. Southall, Y. Wang, A. Yasgar, P. Shinn, A. Jadhav, D.-T. Nguyen, C. P. Austin, The NCGC Pharmaceutical Collection: A Comprehensive Resource of Clinically Approved Drugs Enabling Repurposing and Chemical Genomics. Sci. Transl. Med. 3, 80ps16 (2011). Questions regarding collaboration or access to the NPC collection should be addressed to Ruili Huang and Noel Southall. Tudor Oprea and Oleg Ursu graciously donated the drug subset of the WOMBAT database. This dataset was instrumental in enabling us to validate a large number of curated structures (i.e., curation of curations so to speak). Manish Sud was an early adopter of the NPC resource. His thorough analysis helped us debugged a number of errors in the software as well as database. Matthew Hall provided valuable feedback on the handling of metal containing compounds (certainly beyond organometallics). Antony Williams' critical scrutinies of the compound content revealed numerous errors in the original version of the database. He also provided valuable feedback on other issues related to the software and data curation. We also would like to extend our gratitude to everyone who has contributed to the curation effort of the NPC database. As a token of our appreciation, we have created, for each curator, a dedication badge within the software to acknowledge his/her contribution. 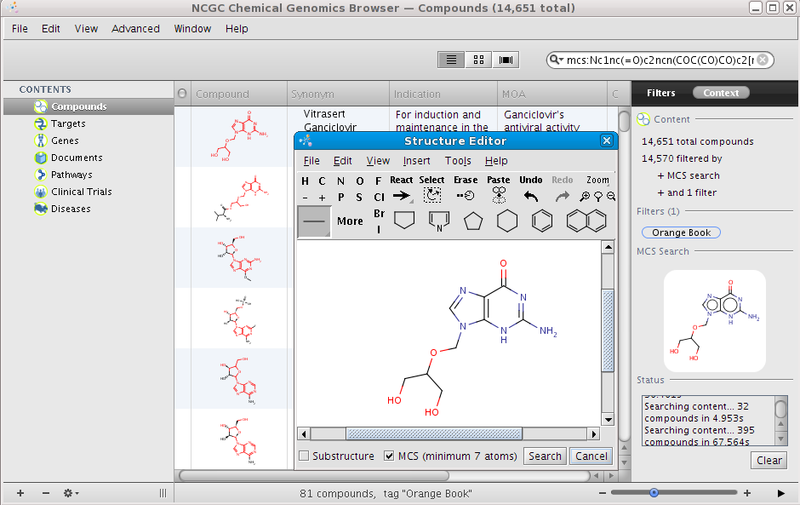 Incorporate additional curated compound records; this brings the total number of curated compounds to 1,974. Share the love: 2D layout is now preserved when exporting structures as MDL format. Rename "NPC curation" filter to "Community curation"
Rework data export per users' feedback; support tab-delimited format. 1.0.16 April 4, 2011 Enable double-clicking on any fragments and topologies to do implicit structure searching (i.e., performing substructure search without graph matching).